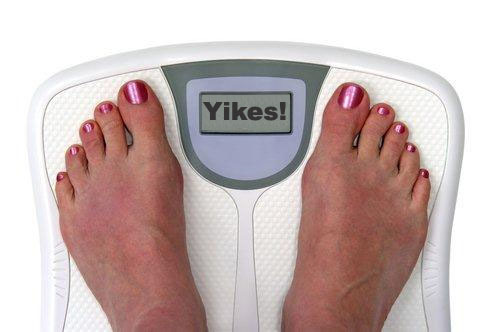 Ok I know this might come as a shock to some of you but contrary to popular celebrity diet claims it is not normal to lose more than 5-10 lbs a week. It just doesn’t happen. So first thing first I want you to be real with yourselves. A weight loss of 1-2lbs per week is normal and amazing! Let’s just get some basic math out of the way here. One pound of fat = 3,600 calories. That means if you lose two pounds in one week you’ve created a deficit of over 7,000 calories (1,000 per day) which is tough to do. If you consider the average 45 minute workout burns around 500 calories and a typical snack has 300 calories that’s like cutting out all your snacks and working out everyday. Creating a 1,000 calorie deficit daily is difficult. So be proud of every pound! Don’t give up – consistency is key. If you are trying to lose weight you really need to be working out 5-6 days a week. Not 2-3, that’s for maintenance. It’s tempting to give up but STAY STRONG and focus. Stop repeating the same workouts over and over in the gym. If you haven’t changed your routine at the gym in the past 3 months then you are probably doomed in the weight loss department. Your body adapts very quickly, you need to constantly be increasing the stimulus in order to stimulate fat loss. Don’t get comfortable, keep striving for more. See my interval running post and plyometric workout for examples of how to spice things up. Typically whenever I’m in a gym, which is often I look around and usually only 20% of the people are actually exercising. The other 80% are wasting their time – don’t be in that 80. One simple rule of thumb I follow is if I can read a magazine then it is not a workout. You should be dripping sweat within 5-10 minutes of starting your workout. Most importantly though believe in yourself and your body! You can do this and will do this. Rome wasn’t built in a day and you didn’t put all your weight on in a week. It could take time but once you’re at your goal that time will be totally worth it! Good luck! !